To all our friends, acquaintances, and good people, I, Gary M. Craig, want to apologize to everyone for not being open this season 2017, as I wrote last year I had every intention to sell Christmas trees again this year however Papa Bob’s is not open for the following reasons, I was unable to secure and lease a location that had high visibility and thus be seen by many people like Papa Bob’s previous location, I was able to find a few places without high visibility, however because Papa Bob’s has not been open for the last three seasons I was apprehensive about how many people would find our new location and whether it would make sense financially. I am truly sorry to anyone who is disappointed that Papa Bob’s Moutain Fresh Christmas Trees are not selling Christmas trees this year, but most of all I wanted to start my tree lot again this year because I know that’s what my Mom and Dad want me to do and I want to honor them by doing so, however I also know they would not want me to open back up if I did not think the location was right. Hopefully in 2018 I will be able to find a good location and Papa Bob’s Mountain Fresh Christmas Trees will be back next season. I hope-as does my wife, our families, our friends, and our MOM and DAD-that everyone has a Merry Christmas, a Happy New Year, and as our MOM has always said, a wonderful and happy life. To all our friends, acquaintances, and good people, I, Gary M. Craig, had every intention of re-opening Papa Bob’s Mt. Fresh Christmas Trees this season, 2016, as I had written last year, however I am unable to do so for the following reasons: the person (Norm Osborne-doing business as the Pinery), who I offered to run, and did run Papa Bob’s in 2014, and who leased directly from the Domenigoni family in 2015, is also leasing the land from the Domenigoni family this season, 2016, and doing business as the Pinery. However, I did believe that I had an understanding with the Domenigoni family that I would be able to lease their land during the Christmas Tree season of 2016 and I did not find out that I would not be able to lease the property until very late this year, too late to find a suitable location for this year. I will however find a new location and will be open in 2017. The Domenigoni family has always been good to me and has always treated me fairly, so I do not fault the Domenigoni family for leasing their property to Norm Osborne and the Pinery, he offered them more money than I had been paying, and even though I told them I would match his offer, they chose to lease to Norm Osborne and the Pinery,it is their property and they can lease to whomever they want to, I am, however, disappointed that they did not lease the property back to me, considering all the years I had leased it from them in the past. I do believe however, and I don’t know how many people would agree with me but I do believe,that the way that Norm Osborne and the Pinery obtained their lease from the Domenigoni family, in my opinion, was wrong very wrong, maybe not from a legal perspective, but morally and ethically wrong, especially considering that if my MOM had not passed away they would not have been selling there at all and as I wrote earlier I will find a new location and I will re-open Papa Bob’s in 2017.I made a promise to my MOM and DAD that I would be open this season 2016, but I know that under these circumstances they understand why I am not, and I hope that are friends and loyal customers do also. My MOM and DAD have always been proud of me and after my DAD passed away when she would tell me that she was proud of me she would always say “and your DAD is proud of you too honey, we just can’t see him being proud of you” and my MOM has always been proud of my tree lot and she would always tell me that my DAD was too. I think the number one reason that my MOM has always been so proud of my tree lot was because I named it after my DAD but I know there were other reasons too, she has always been proud of the integrity in which I tried to run my tree lot, she has always been proud of the quality of our trees and of our people working at Papa Bob’s, she’s always been proud of how happy our customers are getting their tree at Papa Bob’s, and she has always been proud that I have been somewhat successful at my business and she would always tell me that my DAD was proud of me too. I know that they are both still very proud of me, I just can’t see them being proud of me. If anyone would like to read what I wrote last year or look at some pictures of our MOM and DAD please scroll down and look at them and as I said last year and will say every Christmas going forward is that Our family wants to thank everyone for your support and kind thoughts and in our MOM and DAD’s name and spirit wish everyone a happy and joyous Christmas season and a happy and good new year. For those of you who do not know or were not aware our sweet, wonderful, kind, beautiful and loving Mom went to heaven on December 12th, 2013 and for the rest of the 2013 season our fabulous workers and good friends finished the 2013 season for us, and although I know our Mom and Dad (Papa Bob himself – who passed away in 1981 and whom I named my tree lot after) would have wanted me to operate last year (2014) I was just not able to, so I asked Norm Osbourne who has tree lots in San Diego county (named The Pinery) if he would like to operate Papa Bob’s Tree Lot as Papa Bob’s with the same name, workers, quality, prices, equipment, and layout. He said yes and ran the tree lot last year (2014) and although some of my requests of him to run the tree lot the “Papa Bob’s way” were respected, others were not, so if anyone was upset, disappointed, or unhappy I – Gary M. Craig, owner of Papa Bob’s – am truly sorry and sincerely apologize if that happened. And I want to let all our friends and customers know that again in 2015 Papa Bob’s will not be open, although I know that my Mom and my Dad would want me to be open this year (our Mom has always enjoyed being there so much) it is still too hard for me to do so, and although I know it will still be hard next year (and the years after) I have made a promise to both my Mom and my Dad that Papa Bob’s will be open in 2016. (My Mom has always been so proud of our tree lot and she would always tell me “your Dad is too honey, we just can’t see him being proud of you”). So I want all our friends and supporters to know that Papa Bob’s will be open in 2016 with all of the same prices, quality, people, service, equipment, and layout that you are familiar with and although Norm Osbourne (as The Pinery) is selling Christmas trees on the land that Papa Bob’s has graciously been allowed to use the last 10 years (and we appreciate everyone’s loyalty to Papa Bob’s for all these years) there is absolutely NO association between The Pinery and Papa Bob’s or Norm Osbourne and myself (Gary M. Craig) this season 2015. We had this posted at the tree lot last year (2014), and we know our Mom likes what we wrote. 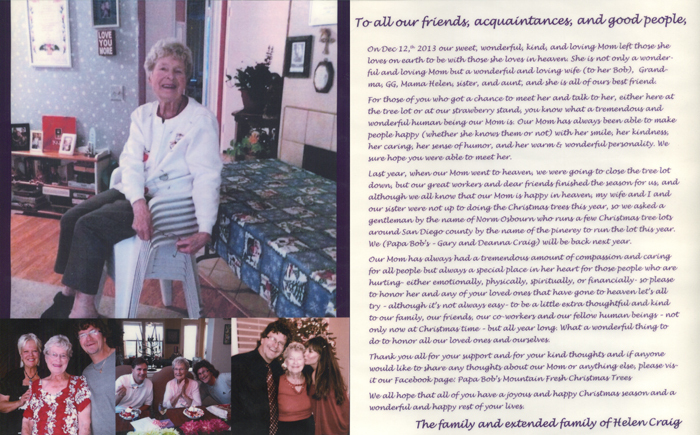 Please read this and look at the pictures we put up of our Mom and Dad. Thank you – the entire and extended Craig family. CLICK HERE TO VIEW PICTURES OF OUR MOM AND DAD. If anybody would like to leave a note or leave a comment, please visit our Facebook page. In our Mom & Dad’s name and spirit we wish everyone a happy and joyous Christmas Season. © 2015 Papa Bob's Mountain Fresh Christmas Trees. All Rights Reserved. Site by Wolfe Interactive, Inc.